clay and limestone: It's time for Burning Bush to be extinguished. It's time for Burning Bush to be extinguished. This beautiful red leaved shrub is not a Burning Bush, it's Hypericum frondosum and it will take care of your late fall/early winter color needs while being a wildlife friendly shrub. 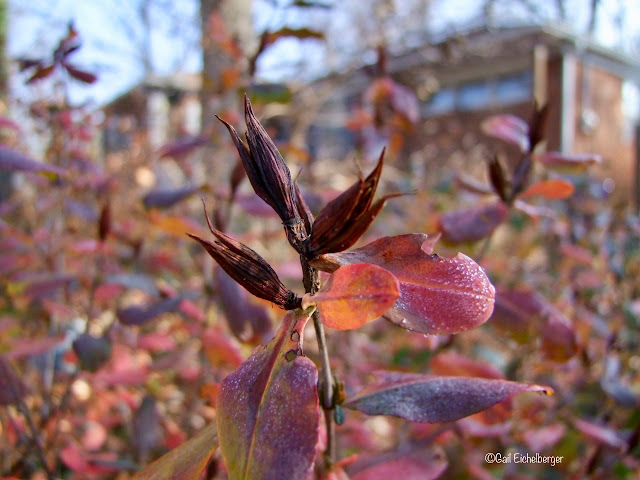 Euonymus alatus, known as winged spindle, winged Euonymus or burning bush, is a species of flowering plant that's neither native nor wildlife worthy. 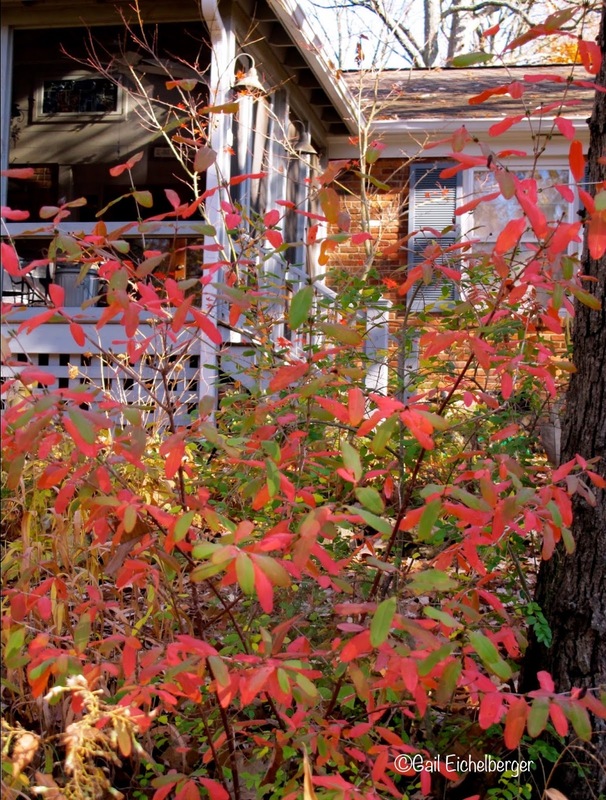 Whenever a friend waxes poetically about the fall beauty of Burning Bush, I agree with them that it does have lovely fall color, then, use the opportunity to gently educate that not all plants sold in local nurseries (Dear Nursery Owners) or seen in our neighbors' yards are native or good for the ecosystem. I tell them "the problem with Burning bush shrubs and some non-natives is how easily they can become invasive. Birds eat the seeds and then poop them in woodlands, forests and neighboring yards; once established they can sucker (spread from roots) like crazy creating a dense thicket that out competes natives." Education is one of the best tools we have to encourage neighbors and friends to avoid invasives and plant more natives. Sometimes, they listen and for that I am grateful. 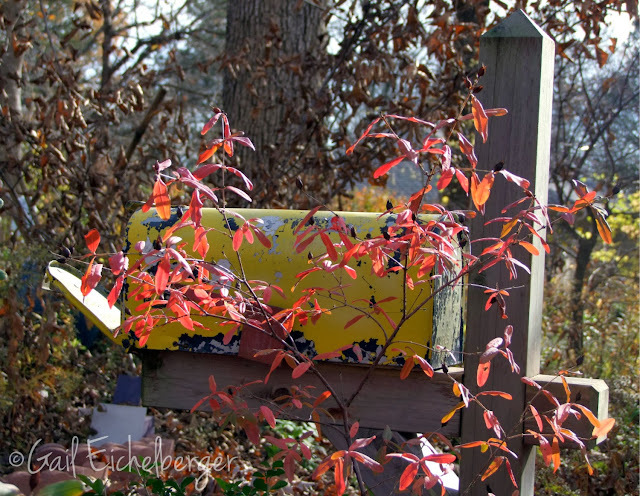 The Hypercolored Hypericums in my garden in mid-December have wowed many a gardener away from Burning Bush. It isn't just a one season wonder like Burning Bush. Add pollen rich golden flowers that are a magnet for pollinators, blue-green summer foliage, reddish-brown seed heads, exfoliating winter bark, excellent wildlife value to its fall hypercolored show and you have a year round beauty. If you haven't already extinguished Burning Bush from your garden, now is a good time to plant critter friendly shrubs like Hypericum frondosum. But, you don't have to take my word for it, let my garden do the talking, you're welcome to stop by to check it out! When the deepest freeze finally ends its blazing glory, this is what I see most of the winter. PS Other natives that make wonderful alternatives to BB are: Oakleaf hydrangea/Hydrangea quercifolia, Arrowwood Viburnum/Viburnum dentatum, Virginia sweetspire/Itea virginica, blueberry/Vacciniums, witch-alder/Fothergilla gardenii. Thanks for stopping by, now pop over to May Dreams Gardens to see other Garden Blogger Bloom Day posts! After that stop by Pam/Digging for Foliage Followup. It's a beauty! I hope your is hyper-colored, too. Magnificent color for this time of the year! Stunning for sure! We finally took out our two Burning Bushes last spring--should have done it years ago, but now we have native shrubs--Aronia and Cephalanthus--in their places. Very lovely! I think it is illegal to sell Burning Bush here in Massachusetts now, as it is so invasive. I find seedlings popping up in my garden every so often, spread from other parts of the neighborhood by the birds. I noticed the fall color of Hypericum for the first time this fall, and was completely blown away. It was incredibly vibrant! I usually tell folks to go for Itea instead of Burning bush, as they hold their leaves far longer - which in my opinion is somewhat of a flash-in-the-pan plant. It takes up space for most of the year, without giving much of any substance in return, and then - a week or two of bling. I had no idea Hydrangea quercifolia is a native - that is great information, which I thank you for! Happy Holidays, Gail! I had never heard of that shrub before, probably because that hypericum is not native this far north. However, it's hardy to zone 5, so it might still work for Northerners who have limey soil. 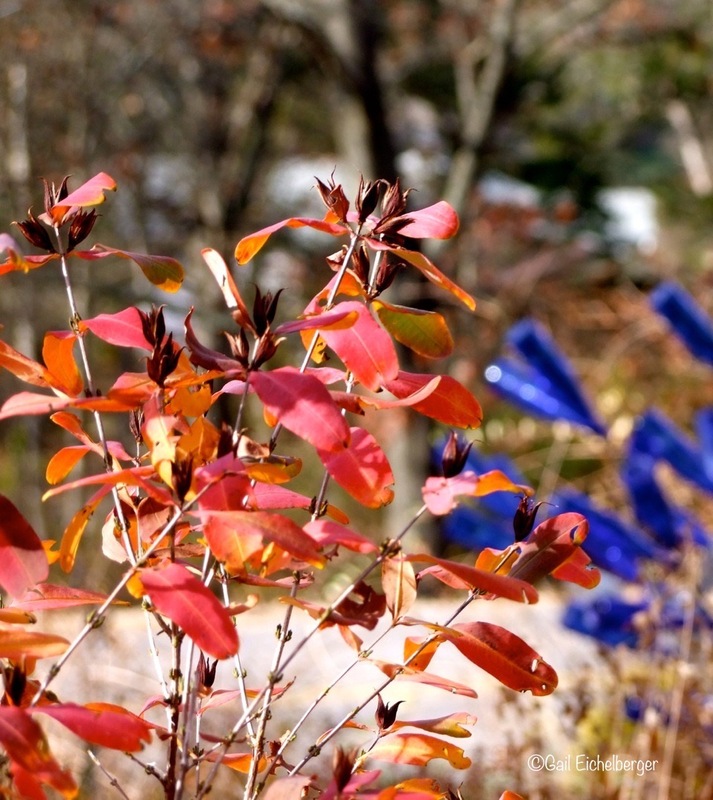 I have acid soil, and blueberry bushes are often recommended as a substitute for burning bush where the soil is acidic. They grow wild on our acreage. I am in full support of banishing burning bush! Another substitute, chokeberry (aronia melancorpa), has glorious ruby leaves in fall. It's one of my favourite shrubs, with flowers in spring, berries that form in summer, brilliant autumn colour, and dark purple berries that persist through winter! Mine, too, Laura! I neglected to put it on my list! Thank you. I haven't had great luck with Hypericums, but yours look awesome. The native Euonymus species - E. americanus (https://www.wildflower.org/plants/result.php?id_plant=euam9) and E. atropurpureus (http://www.missouribotanicalgarden.org/PlantFinder/PlantFinderDetails.aspx?kempercode=k240) also have beautiful fall color and super cool seedpods/seeds. I have one large Burning Bush but Judy forbids me to remove it. I have one St. John's Wort that's still quite small. I hope it gets as colorful as yours, they're gorgeous! Beautiful! 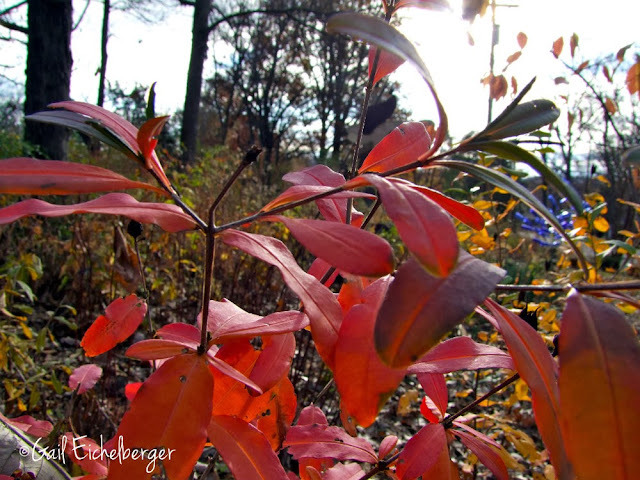 Burning bush just continues to spread into woodlands nearby home plantings around here. It was regrettably obvious this fall. Thanks for a great post.